On her first major international trip, Mrs. Trump focused on her "Be Best" initiative. 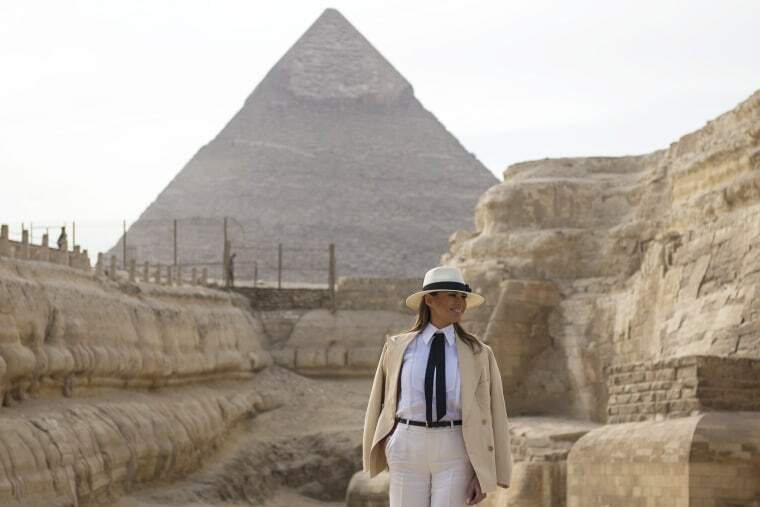 CAIRO — First lady Melania Trump finished a four-country swing through Africa this weekend with a highly choreographed visit to one of the seven wonders of the world. Pausing at a picturesque overlook of the Great Sphinx and pyramids, she turned to reporters and marveled: "Isn’t this incredible?" In many ways, it was. Though she followed in the footsteps of her predecessors by embarking on a solo trip to Africa, Mrs. Trump opted not to deliver a major speech or roll out any policy proposals on the week-long journey. Instead, she sought to foster goodwill in more intimate interactions and, for the most part, let remarkable visuals convey her message. She cuddled infants, read to orphans and fed baby elephants, constantly thanking her "warm and welcoming" hosts. The enigmatic first lady waited until the last stop to reveal a rarely seen side of her personality and answer broader questions from the journalists traveling with her, marking the first time the intensely private Mrs. Trump engaged with the press in a way her husband consistently does. Asked about the Brett Kavanaugh confirmation controversy that dominated headlines back home, Mrs. Trump called the judge "highly qualified" and said she was glad that both he and his accuser, Dr. Christine Blasey Ford, were "heard." She would not engage on a question about whether she believed Dr. Ford but expressed broader sympathy for victims of sexual assault. "We need to help all the victims, no matter what kind of abuse they had but I am against any kind of abuse or violence," she said. With the Great Sphinx perched perfectly over her shoulder, Mrs. Trump said the reason she wanted to come to Africa was "to show the world that we care." Earlier this year, the first lady faced a sharp backlash for wearing a jacket on her way to see migrant children in detention facilities at the U.S. border that read: "I Don’t Really Care. Do U?" Though the White House dismissed that as a media-created story, it cemented the mysterious quality of Melania Trump as a first lady who would not be confined to recent tradition. When her immediate predecessors traveled to Africa, they combined the touristic with the political. Laura Bush announced hefty U.S. funding for AIDS and malaria prevention programs. Michelle Obama delivered a formal speech on race relations and apartheid in South Africa. Hillary Clinton tried to boost trade in the continent and announced millions in aid dollars aimed at eradicating polio. Mrs. Trump worked closely with USAID (which donated 1.4 million textbooks in Malawi while she was there) but chose to focus most of her energy on taking her current "Be Best" initiative international, the overarching message of which is the well-being of all children. The first lady donated hundreds of school supplies, stuffed animals and soccer balls prominently featuring the platform’s logo along the way. Former first ladies often brought their children with them on their jaunts abroad, but Mrs. Trump’s 12-year-old son Barron stayed behind to focus on his studies and soccer, according to the East Wing. Hovering over her travels was what some in the local media called "the elephant in the room" — her husband’s past comments. Earlier this year, President Trump allegedly referred to several African nations as "shithole countries" in a meeting with bipartisan lawmakers. Trump has denied making these remarks. When the first lady announced that her first major solo international trip would be to Africa, many interpreted the move as an effort to improve relations after the offensive words were first reported. Mrs. Trump flatly denied the charge on Saturday, telling reporters she "never heard" her husband say that and when pressed on whether anyone raised the issue on her week-long trip through the continent, she said "nobody discussed that with me." Notably, the normally reserved first lady stressed that she has her "own voice" and opinions and admitted that she sometimes tells the president to put his phone down. "I don’t always agree with what he tweets and I tell him that. I give him my honest opinion and honest advice, and sometimes he listens and sometimes he doesn’t," she said. The first lady appeared at ease throughout various visits to hospitals, orphanages and conservation sites, quite the contrast to some of the more pained and serious moments that have gone viral in Washington D.C. during her first year and a half in the role. "The First Lady did a tremendous job representing our country in Africa — like no one has before. She got to know firsthand the people of Africa and they loved and respected her everywhere she went," President Trump said in a statement Sunday. "Melania told me about her trip in great detail and I’m so proud of the job she’s doing on behalf of children everywhere. She works so hard and does it all out of love." Later asked to identify the singular greatest accomplishment of the humanitarian and diplomatic trip, Mrs. Trump did not identify one, instead referencing all her collective meetings and the gratitude expressed by her hosts. Throughout her travels, the former model raised eyebrows with several fashion choices. The most divisive was the decision to wear a white pith helmet on safari in Nairobi, which many saw as an insensitive colonial-era misstep. In Egypt, Mrs. Trump wore a menswear-inspired ensemble, complete with a black tie and white panama hat. Some on social media compared it to Michael Jackson’s "Smooth Criminal" video look or the villain in "Raiders of the Lost Ark." Asked about recent criticism, the first lady implored: "I wish people would focus on what I do, not what I wear." Moments later, she strode down a long wooden pathway leading to the foot of a massive pyramid as if it were a runway. Placing her hand in one pocket, eyes just below the brim of her designer fedora, she scanned the horizon and stopped precisely in front of the cameras before moving past them.